It certainly feels like I have been away. I have definitely been away from both this blog and Bridgetown. I hadn’t been here for ages. As you know, I had been in Perth cleaning and gardening and packing. The house now looks so good it was very hard to sign the management authority – there were even a few tears. But I did it and now we are looking for tenants. Normally, that would be the easy part but Perth is a boom-bust town and, at the moment, it is going through a ‘bust’ so it is harder than usual to find tenants. Whilst I was cleaning and gardening and packing, dinner consisted of meat/chicken with three veg or a salad. I really understand now people’s need for simple meals. When you are tired and dirty, you just want food. You are not too fussy about the quality of it. But now I am in Bridgetown, I have a bit of time to consider what we are eating. There is work galore to be done here but we are taking it easy for a while. Our number one priority is to unpack all those boxes we brought with us, which invariably means throwing out more stuff. The house was, virtually, full before the arrival of the boxes so some things have to go. We have come across boxes of ornaments that we had previously stored which are now going to the Op Shop. And now we have another box ready to store. I guess this lot will go to the Op Shop with the next down size. Anyway, I am in Bridgetown and things are back to normal. The rider/mower is sick and is at the repair shop waiting for parts to be delivered. The vegie patch has gone crazy with summer produce. There are snake beans and cucumbers galore and soon we will be inundated with tomatoes. And, at last, I have been doing a wee bit of cooking. Number one priority was to find recipes to use up the snake beans. On our first night, I made the subject of the photo to use onions and snake beans from the garden. The next night, I made a lamb and green bean casserole. It required onion, garlic, tomatoes, potatoes and beans – all of which came from the garden. All we had to buy was the lamb. That is what it is all about. That is why we want to spend more time here. 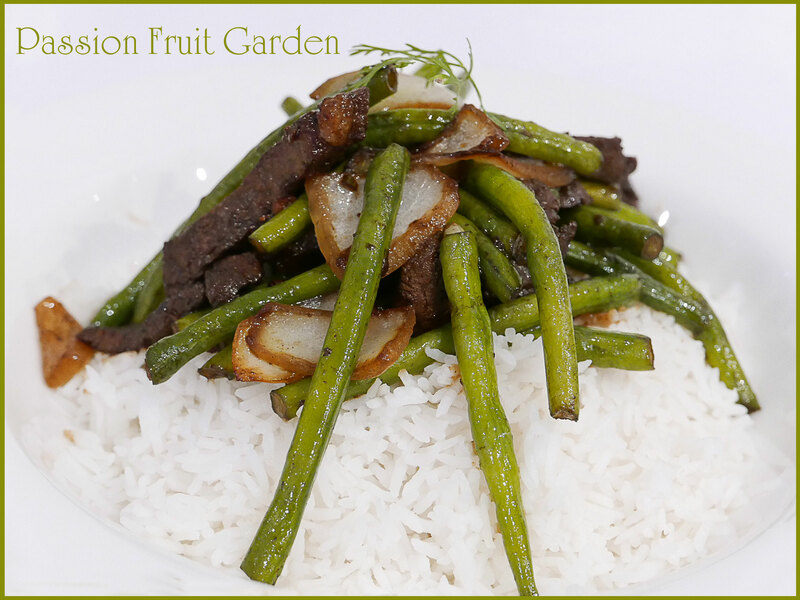 Anyway, today’s recipe – Teriyaki Beef and Beans – is an adaptation of a recipe from 5 Nights a Week by Valli Little. It is both very simple and very tasty. It will serve three or four. Combine all the marinade ingredients in a bowl, add the sliced beef. Leave for at least 10 minutes. Blanch the beans in boiling water for 2 minutes, rinse in cold water and set aside. When ready to eat, drain the meat from the marinade. Reserve the marinade. Heat the oil in a wok, add the meat and stir fry over a high heat. When cooked, remove the meat from the wok. Add the onions and beans and stir fry until just cooked. Return the meat. Add a little of the reserved marinade. When marinade is boiling, turn off the heat. Serve with steamed rice and garnish with a sprig of coriander, if you like. It was so good to have something other than meat and three veg for dinner. This one is definitely a keeper. Posts may be a bit infrequent for a while longer because we still have to move into the unit and we are going to Melbourne for the Flower and Comedy Festivals. Maybe by May, things will have settled down a bit. This entry was posted in Beans, Beef, Eating your bounty, Something Simple, What's for dinner? and tagged Snake beans, Teriyaki beef and beans by Glenda. Bookmark the permalink. You two have the busiest lives but it’s wonderful when you know it’s time for a rest. Your garden and all its produce sounds like pure heaven. All that unpacking and storing and tossing out is not heaven. For me it would be pure hell. Rest up. Your teriyaki beef and beens sounds so tasty and definitely not meat and 3 veg. Hi Maureen, I can’t wait until everything is back to normal. Hi Moya, we are off on a small holiday soon and when we come back, I hope everything will be back to normal. Finding the right tenant is sometimes more difficult Glenda. We go through fits and starts of this. Thankfully we only have one rental property left which makes managing it all that much easier. I love purging and whenever I clean out a cupboard one item always has to be donated, sold, thrown away. Pete on the other hand, well, he is more of the “collector”. Happy sorting and unpacking. How wonderful to have so much to use from your own garden. With my travelling so the last while, our poor veggie patch is looking a little sad. Have a beautiful and happy weekend. Hi Liz, you wonder how you accumulate so much stuff, don’t you?